Reb Zushe's (30th) Yohrzeit is the second day Sukkos. I was ten or eleven years old so this was in 1979-1980. 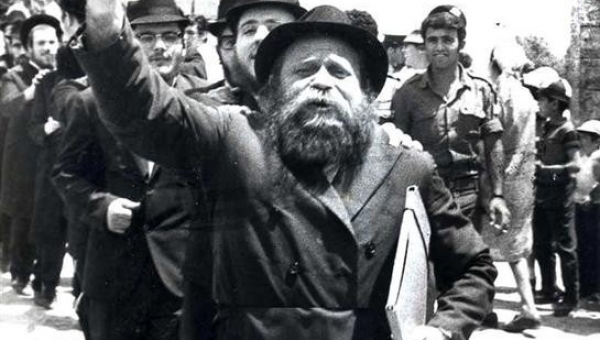 It was Hoshana Rabba, the day when children shook the Rebbe's lulov and esrog, and thus an important day for Lubavitch kids. It was around 1pm and 770 was full of late Hoshana cloppers, and us kids were just hanging around 770. Suddenly there was a loud commotion. Zushe Vilimovsky was standing on a table (he always seemed to be standing on a table) summoning all kids to dance with him in a train, shoulder to shoulder, marching through 770. Zushe lead the march and his face was beaming. The Song was v'somachto and his energy enveloped us. We sang at the top of our lungs and we were all filled with joy. We circled the entire downstairs shul and then outside to the sukkah then back to 770. Thinking about it today, remembering such innocent religious ecstasy, I am thinking of Zushe. He was no child. Known as "the partizan" he had gone through hell. But he had deeper secrets to convey, truer teachings; and on that day his unbridled joy he was able to express more intensely with innocent children. האָב איך קוים מיט צרות געמאַכט. און כ'זיץ אין איר סוכות ביינאַכט. עס טראָגט מיר מיין ווייב באַלד אַריין. דער ווינט וואַרפט די סוכה באַלד איין. מיין ליכטעלע לעשן זיך וויל. מיין ליכטל ברענט רואיק און שטיל. עס זאָל דיר דער ווינט ניט טאָן באַנג. דאָך שטייט אונדזער סוכה שוין לאַנג.